She says: "They call me "mother" ... I don't want to abandon them." (CNN) -- In 2010, Ugandan journalist Gladys Kalibala embarked on a mission to bring attention to her country's lost and abandoned children. Using the power of print, she started a newspaper column and more than four years later the award-winning writer has helped many youngsters reunite with their families and overcome a sense of hopelessness. While writing her "Lost And Abandoned Children" column for New Vision, one of Uganda's leading newspapers, Kalibala came into contact with several forgotten children, some of whom had been born into extreme poverty or suffered from abuse. Through the success of her features, Kalibala was able to rapidly increase awareness of the ongoing plight faced by many local children. And yet she felt the need to do more. As a result, she started putting her contact details at the end of each article, encouraging readers to contact her and contribute what they could for many of these scared and neglected kids. "I really thank my readers because they always turn up, their response is always good," says Kalibala. "They come up and give assistance where some of these children have been taken to school because of their sponsorship." Kalibala with one of the children she supports in Uganda. Today Kalibala has become known as a mother to many of these motherless children -- and in turn she considers them her own. What's most important to her however is that these children receive an education; Kalibala often pays tuition fees for many of these kids out of her own pocket, in addition to the funds provided by some of her supportive readers. "I end up being the mother," says Kalibala, who takes an active role in the kids' lives by regularly checking their school reports to ensure that they're on the right track. "They call me "mother," they call me "grandy," they call me all sorts of names and I end up feeling so bad that I don't want to abandon them... So I've ended up paying school fees for many of them although I'm getting very little money because as a freelance it's really not the best thing. You have to struggle a lot." 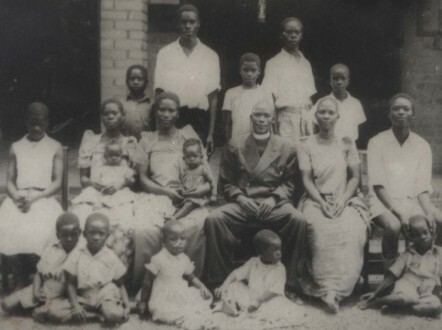 Born into a family of 19 children, Kalibala was raised by her reverend grandfather after her father left the family. The journalist's compassion stems primarily from her childhood; she was born into a family of 19 children and was raised by her grandfather after her father, who had two wives, abandoned the family for another woman. "While growing up with my grandfather, I learnt a lot of things from him," recalls Kalibala. "He was a reverend, a born again and he loved to help needy people. We used to have a lot of people in our home. We used to get visitors in the night, those ones who have failed to get transport, those ones who didn't have anywhere to sleep. We would always share food with them." After her grandfather's death however, Kalibala was forced to drop out of school in order to look after her siblings. To do so, she worked several jobs with the hopes of returning to school at a later stage. When her brother started working in Zambia he offered to pay for her to take a course in journalism. But before he could fulfill his promise, Kalibala's brother died. Nonetheless, Kalibala was determined to make a name for herself and enrolled herself in a course in Uganda. Her luck changed when she began her career in journalism after being offered a job as a features writer at New Vision. Later on, a chance meeting at a police station, where two families were fighting over an abandoned child, let her to begin writing her column and become the voice of the voiceless in Uganda. Kalibala, who hopes to start a foundation whereby she can raise more awareness and support for these children by providing them with shelter and education, says the horrors many of these kids have had to overcome only strengthens her resolve to work harder. "We have to come together; we have to pull out our resources; we have to give care; we have to really work together to see that we help all these needy children we see around," she says. "If we empower them this will maybe help us reduce that number of abandoned children."